Sometimes a product you never thought about trying serves you up a good reason to keep getting it. And if anything, that is exactly the experience I had with the new line of Sprouted For Life Gluten Free Breads from Food For Life. In particular, the gluten free Almond Bread has really struck a chord with me. It wasn’t too long ago that I was introduced to a couple of new breads on the market. While the brand name has been producing gluten-free breads for awhile now, it wasn’t a brand that I actively sought out. Yes, I saw it all the time in the freezer section of Whole Foods and other natural food stores, but I had grown accustomed to snagging Rudi’s or Udi’s or (now) the Aldi liveGfree brand or Canyon Bakehouse. Food For Life was there…I just always overlooked it. Who knows? As an active (even now, with an on-the-mend injury) athlete, it’s important to properly fuel my body and eat wholesome foods. Most products on the market for the gluten-free diet happen to be junk food. It drives me nuts. I hit that gluten-free section of a store and I can find a vast array of cookies, crackers, chips, pretzels, and the like. It is one of the biggest pet peeves of the grocery store. Yes, a lot of people with Celiac and gluten intolerance do miss out on some of the finer treats like Oreos and the like, but the shelves are literally overrun with products that aren’t going to feed your body right and healthy. But Food For Life set out to change that. Through a lot of research and development, Food For Life released the first ever gluten free breads made from sprouted grains, such as quinoa, millet and chia. A majority of gluten-free breads, while satisfying the “gluten free” bread requirement, don’t address the overall health needs of consumers. Without the gluten to give bread the soft, elasticity of regular breads, most manufacturers choose alternative ingredients that mimic the feel of gluten, using egg, milk, and refined starches in order to achieve a softer and chewier texture. But these breads are created from ingredients that you wouldn’t expect to find in natural breads, many of which are devoid of nutrients. Food For Life stepped up and decided to start a line with four varieties of completely gluten-free breads that were specifically created with the health of consumers in mind. Not only are they gluten free, but they are also vegan and made from nutrition packed ingredients that have been sprouted to maximize nutrition and digestibility. I was fortunate enough to be sent one loaf of each of the Sprouted For Life Gluten Free Breads from Food For Life. These loaves come in Original 3 Seed, Almond, Cinnamon Raisin, and Flax. This past week, I decided to reach into the freezer and pull out the loaf of the Food For Life Sprouted For Life Gluten Free Almond Bread. Why? Because I was about to make something sweet and savory, and somehow the thought of bread with a hint of almond flavoring just sounded like it would pair well. I mean, do I really need a reason? You see, I was serving this up as a side dish to my Mexican Corn Dip. I had vegan Kite Hill Ricotta Cheese in my fridge and a jar of fig preserves from Charleston, South Carolina. It was an odd side to have with the corn dip, but it actually worked out really well. I simply preheated the oven and placed two slices of the Food For Life Sprouted For Life Gluten Free Almond Bread on the baking sheet. Into the oven it went to get a nice toast on it. When it was perfectly toasted, I removed the slices from the oven and let them cool slightly. 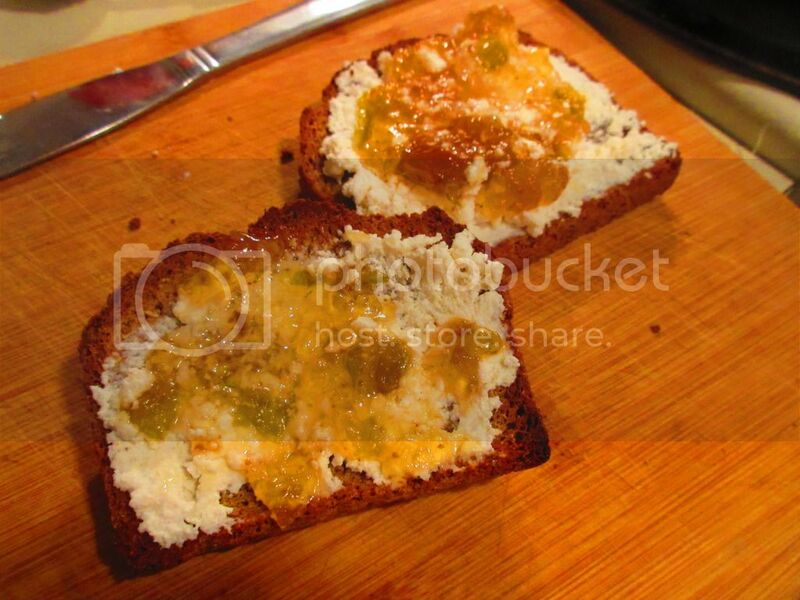 Then, each slice got a schmear of the Kite Hill Vegan Ricotta and then a dollop of the Charleston fig jam. I plated each slice with the corn salsa and dinner was strange…but served. One bite, and I knew I was in love with this bread. For real! The Food For Life Sprouted For Life Gluten Free Almond Bread had the most amazing flavor that I have tasted in bread in a long time. I was blown away with the slight hint of sweetness, making it the ideal vehicle for this spread of ricotta and jam that I topped it off. It was heaven. But this bread doesn’t have to be limited strictly to sweet spreads. In fact, this morning I slathered two slices of it with mashed avocado and it was divine. Honestly, the pairing of the sweet, nutty almonds makes this bread beyond amazing. It makes it a nutritious powerhouse too. The slight nutty flavor compliments anything that you could think to top it off with. I have been impressed each time I have used this bread out of my freezer. And, yes…it was delicious as a grilled cheese sandwich as well. In fact, the nutty flavor with the vegan cheese that I put in my sandwich meshed so well. Delicious any way you slice or slather it. It’s fantastic. Food For Life Sprouted For Life Gluten Free Almond Bread is made with organic almonds for extra flavor, nutrition and to help aid in blood glucose regulation. This bread is specifically developed to help keep you on the go and perform at your best. When you toast it…that rich nutty flavor is released and it is awesome. 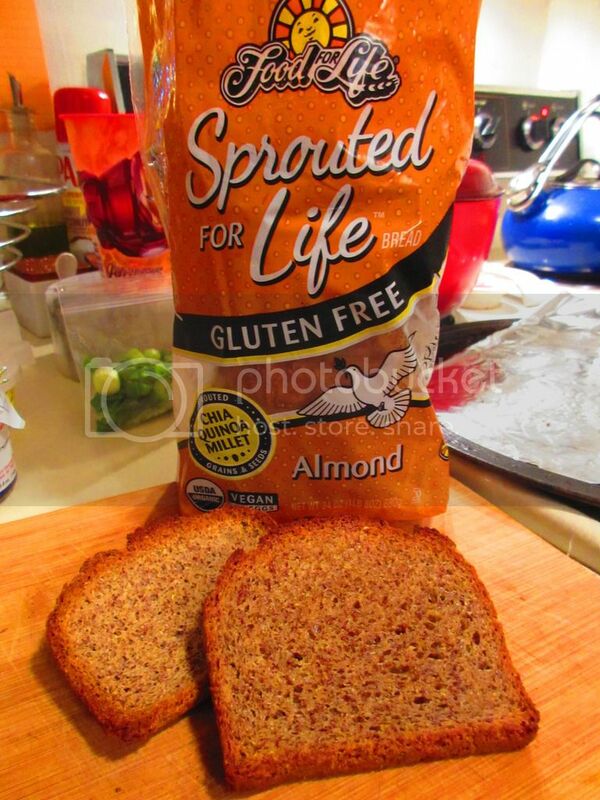 So, what all goes into the making of Food For Life Sprouted For Life Gluten Free Almond Bread? Well, it’s simple. It really is. This bread is made from organic sprouted quinoa (red and/or white), filtered water, organic arrowroot, organic potato starch, organic sprouted millet, organic tapioca, organic applesauce, fresh yeast, organic almond meal, organic safflower oil, organic cactus, organic sprouted chia seeds, organic agave, organic vanilla, sea salt, vegetable gum (xanthan, cellulose), and organic psyllium. Made with sprouted chia, sprouted quinoa, and sprouted millet, this bread is a trio of health. Not only is it made with sprouted grains (which are SO good for you! ), it is also vegan, gluten-free, and high in fiber. It is so rare for a gluten free bread to be high in fiber. This is a welcome addition to my freezer. So let’s discuss the nutritional information for the Food For Life Sprouted For Life Gluten Free Almond Bread. Since passing my final exam in personal nutrition for the nutrition course I was taking and moving on to the advanced nutrition,my nutrition course, I have learned that there is more to counting calories. Sure, it is important, but it shouldn’t be the focus. It’s all about the nutritional aspects of the food. Avocados are high in fat and calories…but SO much better for you than that chocolate bar with the same amount of fat and calories. See what I mean? A serving size is one (1) slice. In this serving, you will be provided with 110 calories, 3 grams of fat, 0 grams saturated fat, 0 grams trans fat, 0 mg cholesterol, 110 mg sodium, 19 grams carbohydrates, 3 grams fiber, 1 gram sugars, and 2 grams of protein. I was freaked out at first with the high calories per slice, but, again, not all calories are created equal and there is nothing fake going into this bread. It’s all healthy, all good, all nutritious. Making this a fantastic choice. I used to turn my nose up at the Food For Life breads due to the high calories, but I have learned a lot about nutrition since then, and it turns out this is one of the best, nutrition-wise, gluten free breads on the market. If you love a hint of nutty sweetness in your bread, I highly, highly recommend the Food For Life Sprouted For Life Gluten Free Almond Bread. It was truly love at first bite. A bit of a surprise, but this is, by far, one of my favorite gluten-free breads I have ever tasted. I was very fortunate to be sent these loaves. I spotted them in Whole Foods the other day. I’m going to be well stocked for the future. This entry was posted in Bread, Breakfast, Cheese, Clean Eating, Entree, Food, Frozen, Fruit, Gluten-Free, Nuts, Products, Review, Sandwich, Side Dish, Spreads, Sweet Stuff, Vegan, Vegetables, Vegetarian by The Celiathlete. Bookmark the permalink.